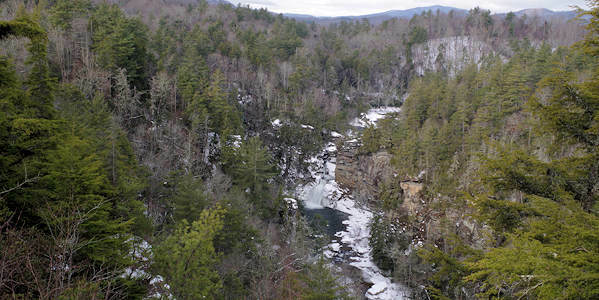 Linville Falls can be even more beautiful in the winter - and more tranquil since the summer crowds are gone! There are two "entrances" to this beloved waterfall. During the spring, summer and fall, we prefer parking at the Linville Falls Visitor Center on the Blue Ridge Parkway (see our main Linville Falls Guide). There you'll have a ranger for questions in May through October, restrooms and the trail to the base of the falls on the river. However, this section of the Parkway closes frequently in the winter because of snow and ice. So we head to the second entrance from the Linville Gorge Wilderness Area (Pisgah National Forest) near the village of Linville Falls. The hike to four overlooks is under two miles - there are some uphill sections, but not difficult at all. From Asheville, it's an easy 57-mile drive via I-40 east to Marion, then north on US Highway 221. Most of the drive is a fast four-lane highway. When you reach the village of Linville Falls, turn right onto NC Highway 183. Drive about a mile and turn right onto the unpaved road at the "Linville Gorge" sign. If there is snow or ice on the ground, you may need four-wheel drive to get up the short hill. The parking lot is a short distance on the left (and it's typically not plowed for snow). 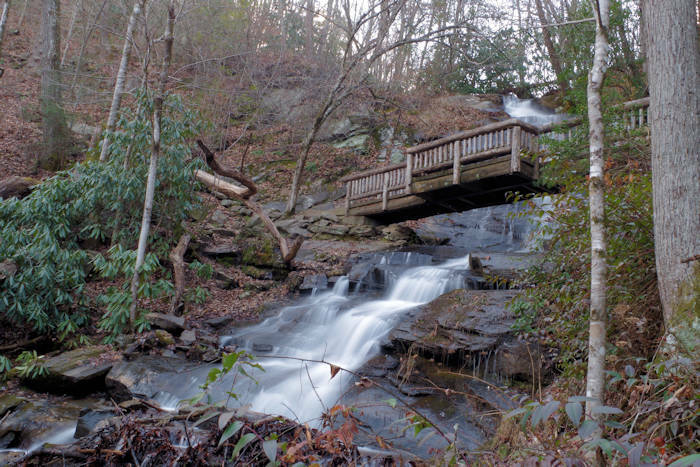 The trail is on the right as you turn into the lot - look for the sign that says "Linville Falls 4/10 mile." Hike mostly downhill through the forest for 4/10 of a mile until you reach the main trail that comes from the Parkway Visitor Center. Turn left and you'll soon see the Upper Falls trail on the left. 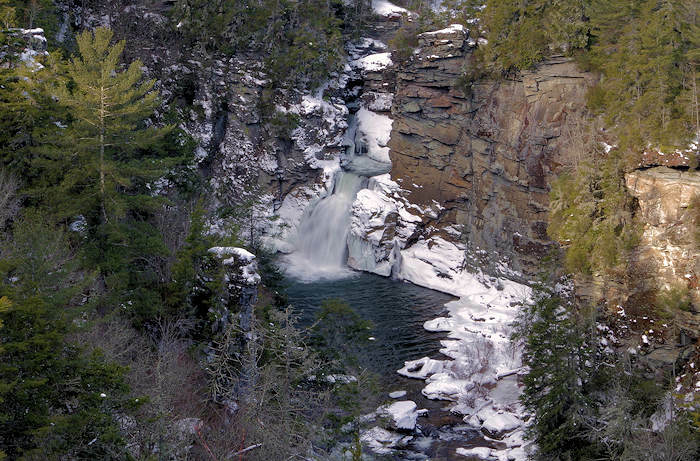 Enjoy a close-up view of the modest Upper Falls. Also from this observation area, stand atop the narrow canyon where the water cascades to the lower falls. Return to the main trail and turn left to continue to two more overlooks. In about 1/3 of a mile, reach Chimney View for views of both the upper and lower falls as well as impressive Linville Gorge. Again, return to the main trail and turn left to hike about 2/10 of a mile to Erwins View. From Erwins View, enjoy a sweeping view of the canyon, waterfall and river. Then turn around and backtrack to the parking area. 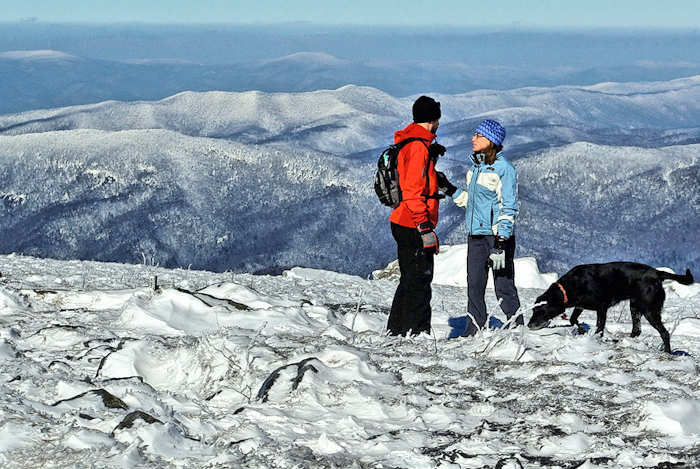 If there is snow on the ground, we highly recommend Yaktrax or similar grips that you tie onto your hiking shoes to prevent from slipping on icy sections, including the steps at each overlook. 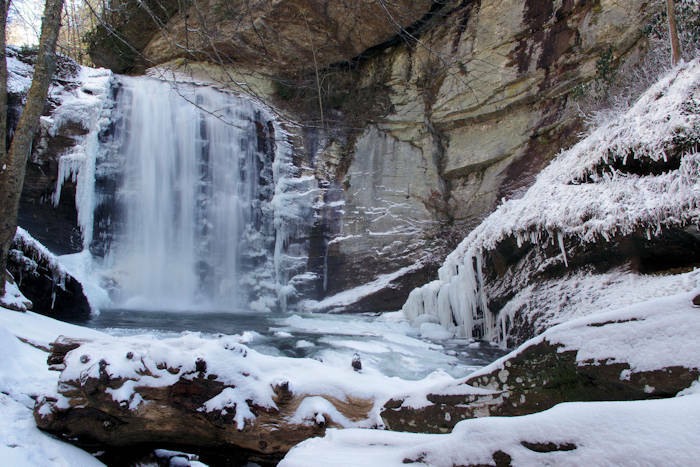 Find more of our favorite winter waterfalls near Asheville. 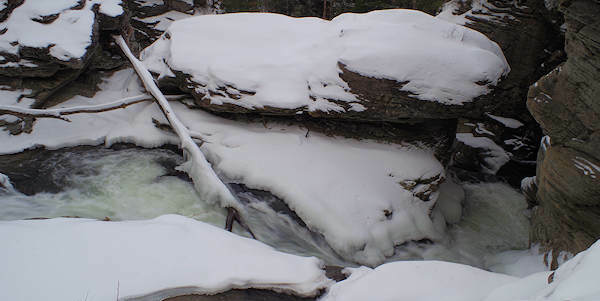 Enjoy our view from our winter visit to Linville Falls.